"In fact, we never hang a man unless he is in the best of health." Although today Brendan Behan is best remembered for his prodigious alcohol consumption (he once referred to himself as "a drinker with a writing problem"), he did generate some memorable works, with his breakthough piece being the 1954 play The Quare Fellow. Based in large part on his own prison experiences due to his involvement with the IRA, it made an appearance on film early on, in a darkly comic view of life and death in the Irish jails. The title character is Sean, a man condemned to be hanged, but his face is never seen (a point retained from the stage play), making him an everyman and avoiding a distancing from the viewer; one can hardly say "that's him" when there is no one representing the character at all. He's not the only man due for death, since another convict is slated for a double event, but the other is reprieved just after new warder Thomas Crimmin (Patrick McGoohan) joins the establishment. Crimmin offers a chipper enthusiasm at first, having been an import from the west country, fresh off the farm and determined to uphold the law and protect society. But he quickly learns at the feet of senior warder Regan (Walter Macken) that things in prison are more shades of grey than black and white. That becomes clear in a major departure from the play, when he learns from Kathleen (Sylvia Sims) the wife of the condemned man the reason for his crime and begins agitating with the prison governor (Philip O'Flynn) for clemency for Sean. McGoohan, in between seasons of Danger Man brings a nice complexity to Crimmins. Determined to be a model warder, he quickly succumbs to Kathleen's charms, making him susceptible to her pleas for mercy for Sean as well as endangering his own incipient career. While he wants to be rigid and play by the rules, he can't quite do that, having more humanity than is probably good for his position. He plays well off Macken, who is sympathetic in his world-weariness, torn between desire for promotion and desire to just retire and be done with his bloody work. Sims is less convincing, shifting emotion abruptly and crying with a stage emphasis that doesn't fit with the reality of the surroundings. 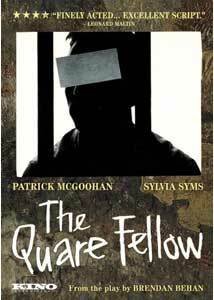 Although lacking a hard dramatic arc, The Quare Fellow works very well as a character study, and more importantly for its vivid picture of life in a Dublin prison. There's plenty of slang, prisoners outsmarting the 'screws' and a news system that spreads information via tapping on the pipes faster than the official word can get around. The brutality and arbitrariness of the death penalty comes under serious scrutiny, making it appear to be far more inhuman than the crimes that it's punishing. It's made ridiculous to some extent by a hangman who spends all of his time drinking himself into oblivion, and a comedy of errors as he leaves his tools of his trade behind in a pub. That suddenly turns to terror as the box is opened and he's nearly torn apart by the fury of the people, many of whom seem to have lost a loved one to the noose. The trade of death has emphasis here as well, with episodes devoted to the crew who are detailed to dig Sean's grave, as well as the asinine policy of making sure that the condemned is healthy enough to be hanged. The play is opened up nicely in cinematic manner, making its stage origins seem left far behind. Image Transfer Review: The package states that the 1.33:1 aspect ratio is the original, but the windowboxing of the opening credits at about 1.66:1 makes that statement more than a little suspect. However, compositions aren't done any serious injury that I noticed. Other than a bit of dirt at the start of the first reel, the source print is in good condition, with no significant damage. The black & white photography has excellent greyscale throughout, with rich blacks. Some finely patterned fabrics are susceptible to moiré but otherwise the transfer looks good. Audio Transfer Review: The 2.0 mono English track suffers from a good deal of hiss and noise, but the sounds of the prison come across vividly. Dialogue is clear enough for the most part, although the dialects are on occasion a bit on the difficult side. There is virtually no music. Extras Review: The principal extra is an interesting program from 1968, Brendan Behan's Dublin (27m:54s), which has color tours of the city, narrated by Behan and including some interview footage of him before his 1964 death. The ravages of prison and drink are deeply etched on his face; though hardly 40 he looks 25 years older. The only other extra is a photo gallery of about 20 stills. Behan's tale of prison life, the bleak fate of the condemned and the dehumanizing effects of the death penalty on others, makes a memorable appearance with Patrick McGoohan in the lead.